Blimey, is it that time of year already? I'm referring of course to the time of year when we look back at the calendar year and reward both the worthy and not so worthy at the most prestigious of awards ceremonies. So, without further ado, I bid you all welcome to the 9th Annual Total Flanker Awards ceremony. As you settle in your seats and begin to crack open the Lambrusco Rosso (it's a classy occasion, after all) let's move straight into the first award of the evening - The Total Flanker Wow, That Really was Surprisingly Brilliant Award - which I am delighted to award to Rugby World Cup 2015. Despite the ticket prices, despite (perhaps, because of) England's premature exit) it was a brilliant tournament. Fantastic rugby, great drama, super atmosphere and worthy winners. Well done to all concerned. Moving along swiftly, we now have the The Total Flanker Time to Move On Award. And the winner is those members of the English Rugby Media who, at the first sign of a poor England performance, call for Steffon Armitage and/or Nick Abendanon to be recalled to the team. This, despite knowing full well that the RFU policy is not to select players playing outside of the English Premiership. Whether it's the right rule or the wrong rule is irrelevant. Players who sign contracts with French clubs do do in the knowledge that they will not be selected for England and are richly rewarded for doing so. It's their choice. And so to our next award, The Total Flanker About as Transparent as a Concrete Block Award which, of course, goes to Premiership Rugby who presided over the biggest cop out since the last episode of "Lost" when deciding not to name and shame those clubs guilty of breaching the salary cap, instead allowing a behind-closed-doors financial settlement to take place away from the prying eyes of those people who loyally turn up week in, week out, to spend their hard earned cash at the turnstiles. Shame on you. Next up, The Total Flanker You See, It Can Be Done Award. 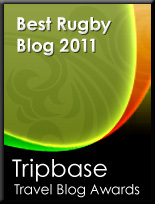 This award is presented jointly to the rugby teams of England, Ireland and Wales who on the final day of the 2015 Six Nations discovered that, when faced with a Championship to be decided on points difference, it was actually possible to win rugby matches simply by scoring lots and lots of tries. Who'd have thought? The fact that, come the World Cup, this dangerous experiment was for the most part abandoned, is one of life's little mysteries that may never be solved. The penultimate award tonight is The Total Flanker Greatest Ever Result in the History of International Rugby…Ever Award. I refer of course to Japan's last gasp victory over the mighty South Africa in their opening World Cup match in October on Day 2 of the competition It was not just the fact that Japan won a seemingly impossible victory - it was the manner of that victory - playing exhilarating, fast, running rugby throughout and then bravely eschewing a last minute penalty kick to go for the winning try - that secures the Japanese this award. It was also a match that kick-started RWC 2015 into life, a position from where the tournament never looked back. Finally we have The Total Flanker You Will Be Missed Award. This award goes jointly to two giants of the game - Jerry Collins and Jonah Lomu. You both gave so much to the game of rugby and and in different ways both transcended the sport. Rugby needs people like you and you will be sorely missed. RIP both. Well, that's all for this year folks - I thank you for your patience and support throughout 2015 and may I take this opportunity to wish you all a Happy and Prosperous 2016. See you on the other side.